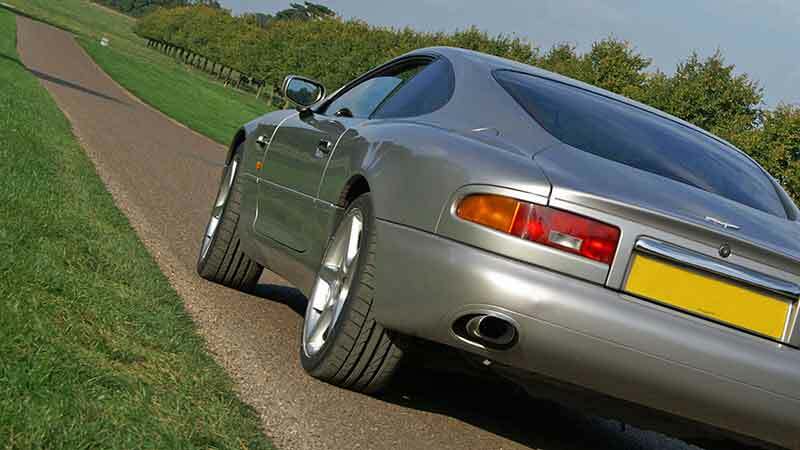 Why Hire an Aston Martin DB7? An Aston Martin hire gives you or a loved one the chance to savour the delights of this fabulous luxury grand touring car. Hailed by many as being one of the world’s most beautiful cars, the Aston will delight you not only with its looks, but the way it sounds and drives. Hiring an Aston Martin DB7 gives you the chance to experience prestige car hire without the high costs often associated with Aston Martin rental, or the impracticalities of ownership. Hire an Aston Martin for a day or weekend and you’ll enjoy comfortable, luxury motoring in stunning Yorkshire or Lancashire countryside. 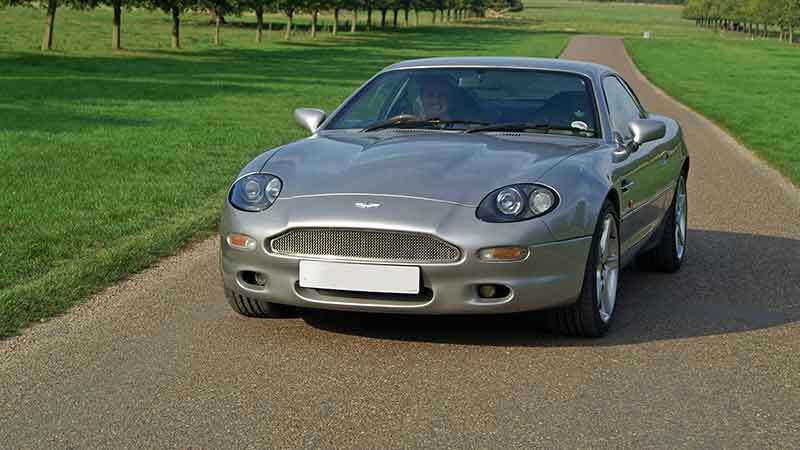 An Aston Martin DB7 hire makes an unusual and memorable gift as well as a superb alternative wedding sports car. DB7s are tipped to become an increasingly desirable modern classic car worthy of investment. Why not try one before you buy? Rev the engine, delight in the deep rumbling exhaust note and imagine you are James Bond in this beautiful silver sports coupé. The view over the bonnet is awe-inspiring and the supercharged engine has instant urge. Inside the Aston is finished in dark grey hand sewn Connolly leather and burr walnut trim. It is a British built luxury sports car that shouts class and prestige. You’ll turn quite a few envious heads. Being well equipped with modern technology including power steering and servo assisted brakes it is smooth and easy to drive, and the handling inspires confidence. There’s reasonable room for two inside, although the back seats are only really suitable for children. Our DB7 has the 3,200 supercharged six cylinder engine. Being one of only around 750 of the supercharged cars to have a 5 speed manual gearbox, it is a particularly desirable example. Drive an Aston Martin DB7 and you’ll enjoy its low-rev flexibility and progressive build up of power. And all the time you’re accompanied by the exhaust note, which just has to be one of the best ever! An Aston Martin Hire will give you a memorable classic car experience. The Aston Martin DB7 was produced from September 1994 to December 2004, financed by Ford (which owned Aston Martin at the time). It was developed in partnership with Tom Walkinshaw Racing (TWR) and assembled at the TWR Bloxham plant in Oxfordshire. Many racing sports cars such as the Jaguar XJ220 were built at the Bloxham plant. Tom Walkinshaw passed away in 2010 and today Astons are prepared by Prodrive for national and international race series including An British GT and Le Mans. The DB7 continued Aston Martin’s heritage for building beautiful cars. It shares many of the features of its famous grand touring car predecessors from the DB4, launched in 1958, to the DB6 which finished production in 1971. This is especially true of the distinctive grille and muscular rear wings. When unveiled at the Geneva Motorshow in 1993 the car received a rapturous press reaction for its styling, the work of British car designer Ian Callum. 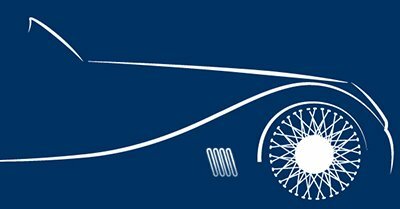 Described as a ‘gentleman’s club on wheels’, the car was a class act which secured Aston’s future after years of uncertainty. By the early 1990s only a handful of cars had been trickling out of the factory gates. The DB7 changed all that, with over 2,400 six-cylinder cars sold – a company record. Our Aston Martin hire car is one of a long line of models produced from 1914 onwards. To see more about Aston Martin models of the past visit their Heritage site. 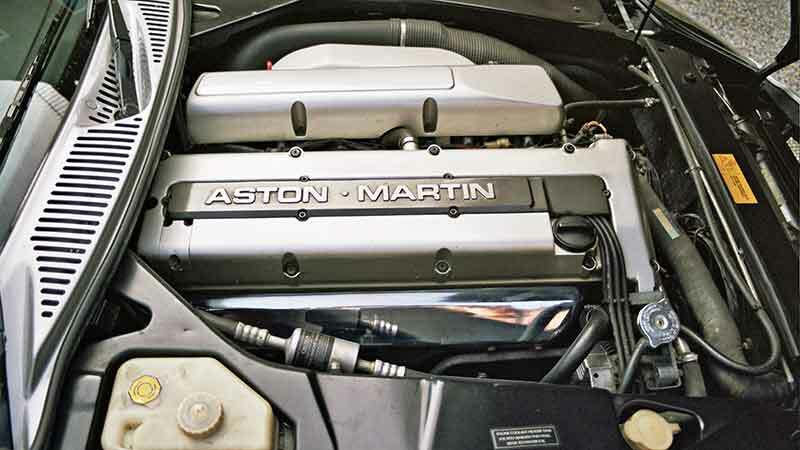 The Aston Martin DB7 straight six supercharged DB7 i6 first came off the production line in 1994 and was produced until 1999. Its predecessor was the Aston Martin V8 Vantage. 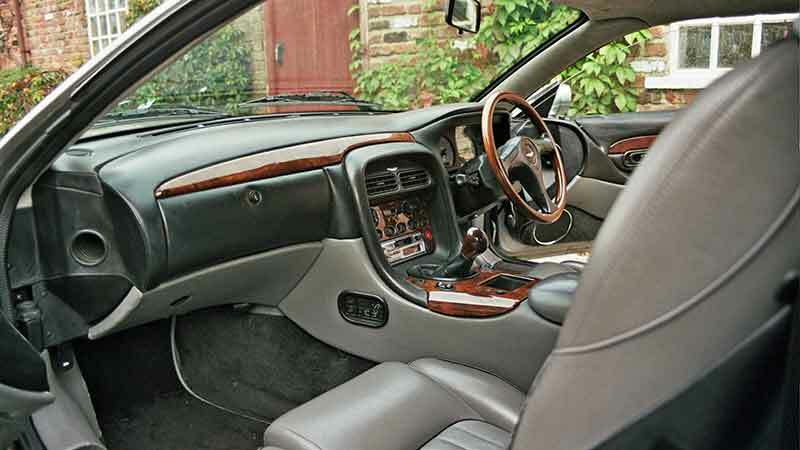 The underpinnings of the DB7 are shared with the Jaguar XK8, but the DB7 was a much more expensive car. 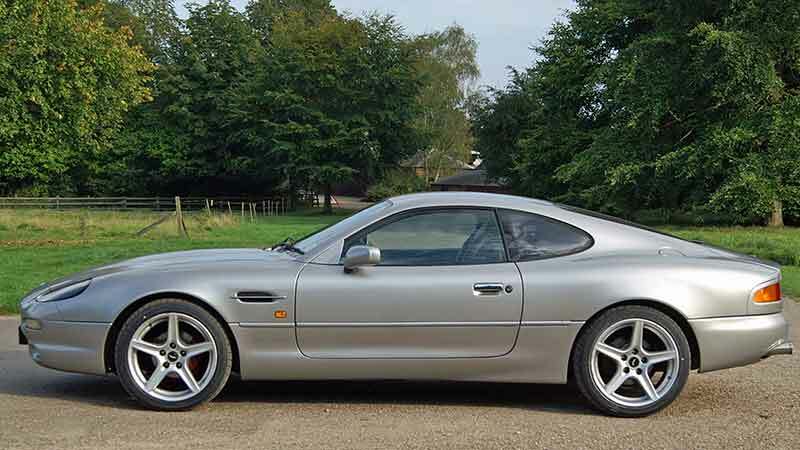 The original six-cylinder DB7 is rarer than the Vantage V12, with just 2,461 cars built including 885 drop tops. Our Aston Martin hire car is available for collection in Keighley, West Yorkshire, not far from Skipton, the ‘Gateway to the Dales’. Our location is within easy reach of all the major towns and cities in the north of England. We are in an ideal location for Aston Martin Hire Bradford, Halifax and Huddersfield. For Aston Martin hire Preston, Blackburn, and Burnley, Lancashire, you don’t have too far to travel either. We are within an hour’s drive of most of the towns in Lancashire via the M65 or A59. Manchester Aston Martin hire is within 50 miles of our Keighley base. Once you’ve collected it you can drive our Aston Martin hire car anywhere in the UK subject to our terms and conditions.